Today’s Coast Guard, with nearly 42,000 men and women on active duty, is a unique force that carries out an array of civil and military responsibilities touching almost every facet of the U.S. maritime environment. 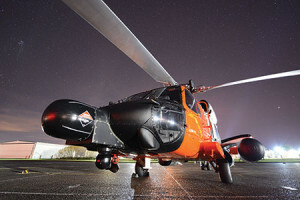 The Columbia River Sector of the Coast Guard’s 13th District has responded to the full range of missions in a uniquely challenging and complex maritime environment. Its command center near Astoria overlooks the most dangerous area on the West Coast – the world-famous Columbia River Bar, also known as the “Graveyard of the Pacific”. The agency is responsible for maritime safety, security and environmental protection from the Pacific Ocean to coastal Oregon and southern Washington and associated ports, as well as throughout the Columbia, Snake and Willamette River systems as far inland as Idaho. Sector Columbia River executes these missions along 420 miles of coast, 465 miles of inland rivers and 33 ports with a workforce of 500 active duty, 105 reserve, 29 civilian and 890 volunteer auxiliary personnel. Primary maritime stakeholders include deep draft shipping, ports and terminals, charter and commercial fishing vessels, the towboat and barge industry, recreational boaters and all others who benefit from, utilize and enjoy our waters. The Astoria Regional Airport in Warrenton serves as headquarters and home to the Sector Commander, who also serves as Captain of the Port, Federal Maritime Security Coordinator, Search and Rescue Mission Coordinator, Officer in Charge of Marine Inspection, and Federal On Scene Coordinator. Also in Warrenton are Air Station Astoria and the Sector Command Center, Response and Logistics Departments. 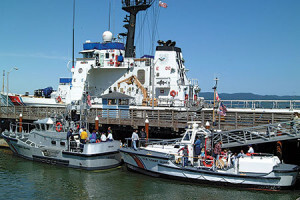 The Sector Prevention Department, which includes Inspections, Investigations and Waterways Management, is Marine Safety Unit Portland, Oregon, a two-hour drive from the Sector proper. 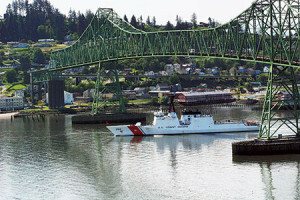 In addition to Air Station Astoria and Marine Safety Unit Portland, other Sector Columbia River subunits include three surf stations (Stations Tillamook Bay, OR; Cape Disappointment, WA and Grays Harbor, WA); Station Portland; Aids to Navigation Teams in Astoria and Kennewick, WA; and the buoy tender Bluebell, home ported in Portland. The National Motor Lifeboat School is a unique U.S. Coast Guard training center that operates under the Office of Boat Forces. With a staff of approximately 60 personnel, it serves as a center of excellence for the Motor Lifeboat (MLB) platform and provides resident training as well as MLB readiness and standardization assessments. They are located near the mouth of the Columbia River at Cape Disappointment just outside of Ilwaco, WA. 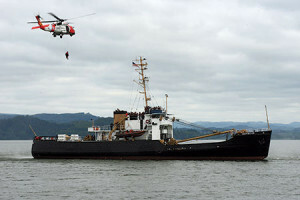 The area provides the training grounds for Coast Guard personnel learning to care for and operate the 47-ft. MLB. The school offers three courses; Introduction, Heavy Weather Coxswain and MLB Surfman. 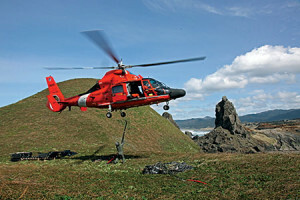 The Coast Guard’s Advanced Helicopter Rescue School is where Coast Guard helicopter pilots and crews receive training in conducting rescues in heavy weather and heavy surf conditions. Formerly known as the Advanced Rescue Swimmer School, it was started to provide specialized skills to Aviation Survival Technicians when dealing with the challenges of cold water, high seas and cliff rescue work. The 5-day course of instruction involves the entire helicopter air crew from air stations all over the nation. These courses are held during the early Spring and late Fall to take advantage of the heavy seas and inclement weather patterns that cross the Northwest. This advanced course brings duty standing Rescue Swimmers from air stations around the nation to the classroom setting at Tongue Point. Here the instructors prepare the rescue swimmers and their air crews to conduct their business of rescue in the surf of coastal shores, on high seas of the open ocean, and along cliffs and caves found on the rugged coast. Vertical surface training or cliff rescue is an invaluable capability that requires helicopters to hover close to rocky outcroppings while lowering a tethered rescue swimmer to recover stranded or injured persons. The legal basis for the Coast Guard is Title 14 of the United States Code, which states: “The Coast Guard as established January 28, 1915, shall be a military service and a branch of the armed forces of the United States at all times.” Upon the declaration of war or when the President directs, the Coast Guard operates under the authority of the Dept. of the Navy. As members of a military service, Guardians on active duty and in the Reserve are subject to the Uniform Code of Military Justice and receive the same pay and allowances as members of the same pay grades in the other four armed services. 1790: Revenue-Marine created within the Treasury Department Later renamed Revenue Cutter Service. 1915: Revenue Cutter Service combines with the U.S. Lifesaving Service (est. 1848) to create the Coast Guard. 1939: U.S. Lighthouse Service (est. 1789) added. 1946: Steamboat Inspection Service (est. 1838) added. 1967: Coast Guard transferred to Dept. of Transportation. 2003: Coast Guard transferred to Dept. of Homeland Security. I will endeavor to reinforce the worldwide reputation of our forefathers in the Lifeboat Community. I will maintain a guardian’s eye on my crew at all times, and keep a cool, yet deliberate, hand on the throttle. I will give of myself and my knowledge as those who gave to me; so as the line of Coast Guard Surfman will live forever. I will ensure that my supervisors rest easy with the knowledge that I am at the helm, no matter what the conditions. I will never unnecessarily jeopardize myself, my boat, or my crew; but will do so freely to rescue those in peril. I will strive with dedication and determination to bring credit upon Coast Guard Surfmen past and future.